Sixty-six days. At this hour, that is how long Khader Adnan has gone without food to protest his detention without charge by the Israeli government. Unless you follow events in the Middle East closely, it is possible this is the first time you have heard of Adnan, or only heard of his in the last few days as Western media outlets finally started to pick up the story. In many ways this is understandable; after all, Adnan is not the most sympathetic of characters. A 33 year old father of two and baker in the West Bank town of Arraba, he is also a member of Islamic Jihad, a small Palestinian group dedicated to the establishment of an Islamic state in the Holy Land. It is this last detail that led to Israeli forces raiding his house in the early morning hours of December 17. But, instead of being charged with any crime, Israel has placed him in “administrative detention”, a decades-long policy that allows the government to hold prisoners without charge for six months and can be infinitely renewed. This is not the first time Adnan had been arrested and placed in administrative detention. Since 1999, he has been arrested and detained seven times with his total time in detention being over three years , but never charged with any crime. This is not uncommon and is the reason why so many activists find administrative detention to be repugnant; with no guarantee of due process, there is no guarantee that Israeli forces will not abuse the power that has been given to them and that true criminals are the only ones targeted. However this time Adnan decided enough was enough. The day after his arrest in December, Adnan started his hunger strike in protest of this policy and the indignity he claimed it represented. For whatever reason, this campaign struck a nerve within the region. 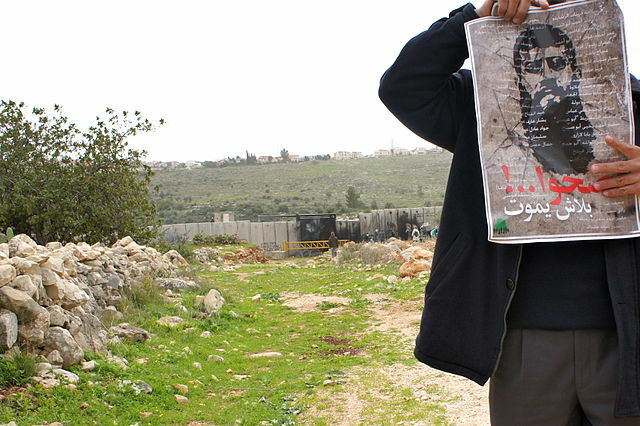 Solidarity campaigns emerged in the West Bank and around the world. Other prisoners are reported to have joined in his fast. Soon, “Charge him or release him” became the common rallying cry in the online campaign for his release, a demand echoed by human rights groups such as Human Rights Watch, Amnesty International and the Carter Center amid growing calls for the international community to act. After all, if he is the terrorist and public safety threat that the government claims he is, there should be enough evidence to actually charge him with a crime. Not only is this appropriate in a fair and just legal system, but it would also help authorities navigate the two possible negative consequences Israel currently faces: the likely public backlash over his death in detention or the possible encouragement other prisoners would receive to repeat Adnan’s tactics if he was released. Instead, Israeli officials have kept him shackled to his hospital bed even as his health deteriorated to the point where medical experts believe he may be past the point of no return. Yesterday, on the sixty-fifth day of his fast, Adnan set the record for Israel’s longest hunger strike. In doing so, he has brought international attention not just to his situation, but to the entire policy of administrative detention and the conditions that Palestinian prisoners face in Israeli jails. Later today the Israeli Supreme Court will hold a session considering Adnan’s appeal and decide his fate. In doing so, they will likely be deciding more than just whether he remains in prison, but by extension whether he will live or die. So sympathetic or not, it appears that Adnan may be fighting the right fight here, and one that is long overdue. In a letter to the public delivered via his lawyers he wrote, “I starve myself for you to remain. I die for you to live. Stay with the revolution.” These words may be important to keep in mind as Tony Karon points out, it is unclear what role in the public imagination Adnan will take on following this, but the winds of change can come from unexpected places. Just ask Tunisia, where a desperate act by a common fruit vendor overthrew one of the most stable governments in the region.